Scientists from the University of California, San Diego have developed an easy-to-wear, temporary tattoo that can accurately measure glucose levels in the skin, allowing diabetics to monitor their levels without a finger prick test. At the moment, diabetics check their glucose levels by pricking their finger and analyzing their blood several times a day. The tattoo would allow them to monitor their levels continuously and painlessly. It was invented by Amay Bandodkar – a graduate student at the Nano Engineering Department and the Center for Wearable Sensors at the Jacobs School of Engineering at the University of California in San Diego – and her colleagues. The tattoo consists of woven electrodes that are printed out on rub-on tattoo paper. It has now been trialed, the results of which were published in the journal Analytical Chemistry. The tattoo works without measuring blood; instead it extracts and measures glucose in the fluid between skin cells, offering a non-invasive method of glucose testing for diabetics. It does this by applying a very mild electrical charge to the skin for 10 minutes. This forces the sodium ions – which carry glucose – from between the skin cells, flowing towards the tattoo. 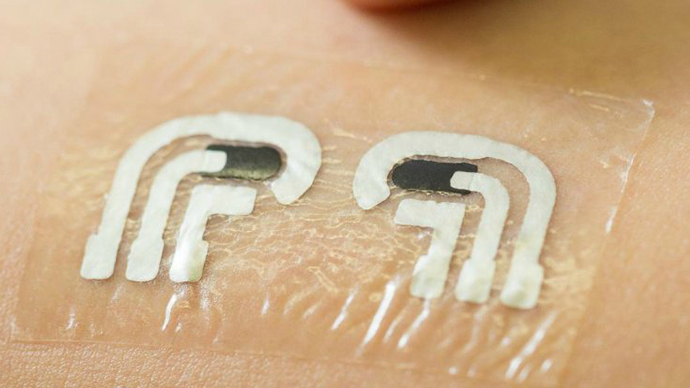 A sensor in the tattoo then measures the electrical charge, which is produced by the glucose. Because glucose levels in skin fluid are 100 times lower than in the blood, the tattoo has a very sensitive sensor. A trial on seven people without diabetes found that it was as accurate as a finger prick. At the moment, the tattoo is unable to provide the numerical read-out that diabetics must have to regulate their blood sugar level – but Bandodkar’s team is working on adding that in the future. "The readout instrument will also eventually have Bluetooth capabilities to send this information directly to the patient's doctor in real-time or store data in the cloud," said Bandodkar in a press release. The team is also working on ways to make the tattoo last longer; right now it lasts for a day at a time. "Presently the tattoo sensor can easily survive for a day. These are extremely inexpensive – a few cents – and hence can be replaced without much financial burden on the patient,” said Bandodkar. The scientists hope their new innovation could help the wider population by giving researchers the opportunity to find out more about the causes and potential prevention of diabetes, which affects hundreds of millions of people. A similar device called GlucoWatch was launched in 2002, but was discontinued because it caused skin irritation. But since this tattoo uses a much lower electrical current, users don’t feel anything except for a mild tingling in the first 10 seconds of use.